During December 2001, a trial excavation was conducted at Et-Taiyiba (Permit No. A-3546; map ref. NIG 24220/72340; OIG 19220/22340), in the wake of discovering ancient remains while digging a sewer trench. The excavation, carried out on behalf of the Antiquities Authority and financed by the Gilboa Regional Council, was directed by K. Covello-Paran, with the assistance of A. Mokary (field supervision), V. Essman and V. Pirsky (surveying), E.J. 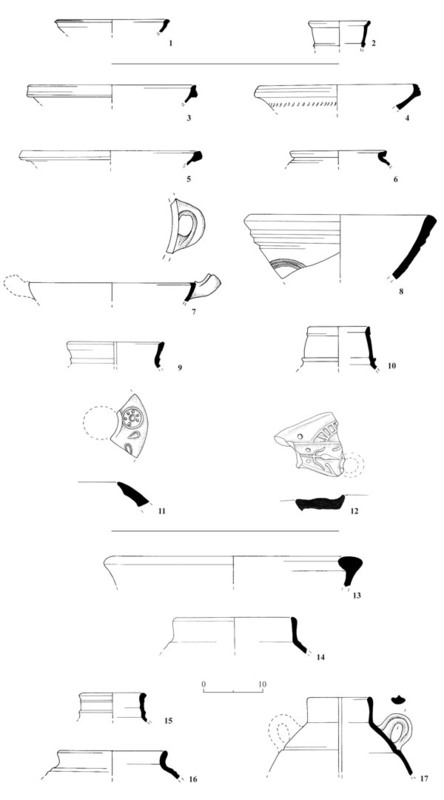 Stern (pottery analysis), H. Tahan (drawing) and Y. Gorin-Rosen (glass analysis). Et-Taiyiba is located in Ramat Yissakhar on the western bank of Nahal Yissakhar. The site had been extensively surveyed in the past (Map of Gazit , 1991, Site 53), yet the present excavation is the first at the site. Two excavation areas (A, B) were opened, revealing architectural remains from the Roman, Byzantine, Crusader and Mamluk Periods, as well as additional ceramic finds, dating to the Hellenistic period. Four squares were excavated (66 sq m; Fig. 1), exposing three strata dating to the Byzantine, Crusader and Mamluk periods. Stratum I (Mamluk Period). 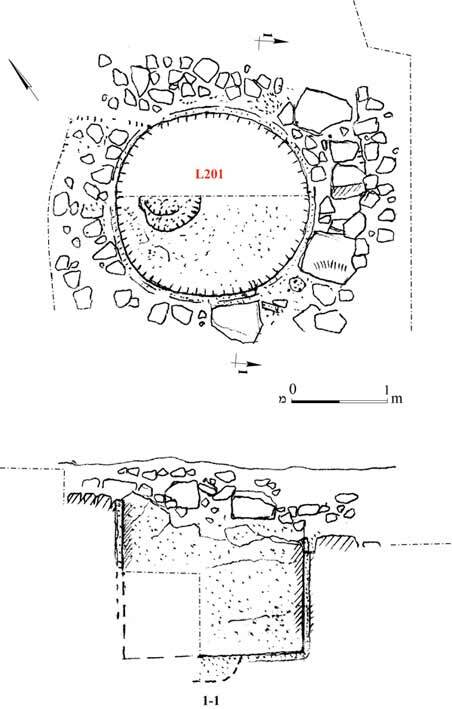 Very fragmentary building remains included a wall (W124) and a stone floor (L108; Fig. 2). Stratum II (Crusader Period). This was the best preserved stratum. Architectural remains of two buildings were exposed (Fig. 3). Two construction phases that included the raising of floors and the partitioning of rooms were distinguished in the eastern building. Some of the walls from this period were preserved 0.9 m high. The western building consisted of a large basalt olive-oil press of the direct-pressure screw type, in situ (Fig. 4). The western building was probably an olive-oil installation and the eastern building—an assemblage of rooms connected to the same unit. Additional finds consisted of potsherds, iron nails and implements, as well as glass. Stratum III (Byzantine Period). A single wall segment from this stratum was dated according to the pottery found in fills associated with it. Stratum II walls were directly overlying this wall. The collecting vat of a winepress, dating to the Roman period, was excavated east of Area A. This circular vat (diam. 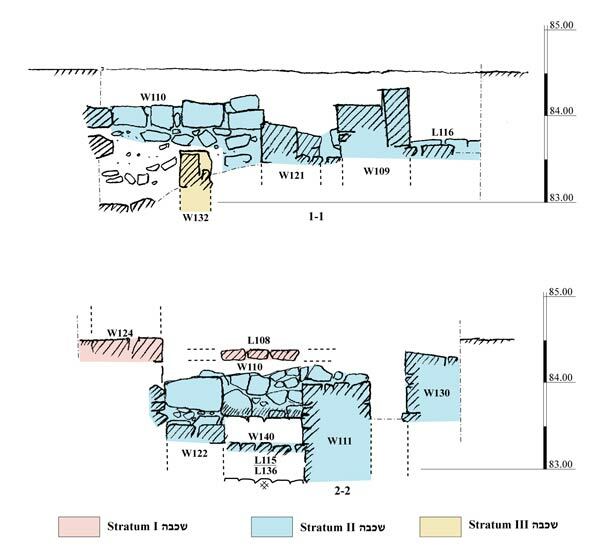 2 m, depth 1.5 m) had well-preserved plastered walls (thickness of plaster 8 cm; Fig.5). This winepress was located on the other side of a wadi bed, in close vicinity to Horbat Haddad. The excavation results enable us to shed light on the Byzantine, Crusader and Mamluk occupations at the site. The exposure of an olive press, weights, and a winepress suggest that industrial activities were undertaken at the site’s margins, near an abundant spring and a road that was used to transport the produce. The site had undoubtedly close contacts with Horbat Haddad, to the south. During the Crusader period, a castle named Forbelet (‘Afrabala?) was built at the site. This Hospitaller castle was destroyed in 1187 by Saladin. The castle was not totally demolished since it was later occupied for a few years by marauding Muslims during the siege of the nearby Crusader castle Belvoir. Part of one of the castle’s towers is still standing today. The construction of a Crusader castle at the site reinforces the advantages of its location near a spring, fertile agricultural land and an important ancient road, as well as being a strategic spot for defense. 1. Area A, general view, looking northwest. 3. Area A, Stratum II, W111 of eastern building and W130 of western building, looking north. 4. Area A, Stratum II, western building, olive crushing basin, looking south. 5. Area B, winepress vat.